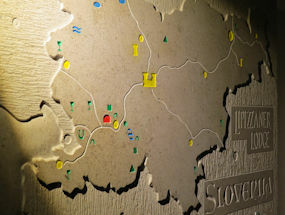 Check out the map to see how Lipizzaner Lodge can be your comfy base to explore our "zone", being all Green Slovenia, north Italy, Istria & north Croatia. We think we have the very best location in all Green Slovenia, (see above) you will be in the middle of the countryside, but just 10 mins from the town of Postojna. We are in between 2 of Slovenia's top tourist destinations, Postojna Caves (10 mins) and Predjama castle (8 mins) and still just 10 mins from an incredible 4 junctions in all directions of the ultra modern Slovenian motorway system.. but in lovely Landol you won't hear them and you won't see them! 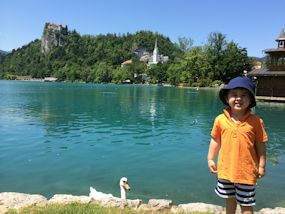 You'll need a minimum of 3 weeks to have any chance of experiencing what Green Slovenia has to offer and most people start planning to return as soon as they leave. 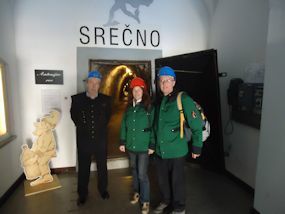 It's funny the number of times we hear, "We didn't know there was so much to do & see in Slovenia!" Well, now you know!! Here are just some possible itineraries to show you how much you could get up to here and the enormous variety of opportunities. Your weeks will fly by doing something different every day, all so close to Lipizzaner Lodge and there is plenty of time and space for relaxation too. So please enjoy our weekfull of ideas and then another week and another, the choice is yours! 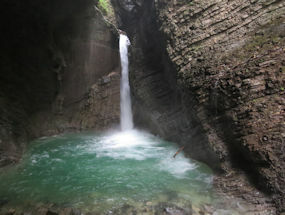 On Monday you can go to visit the amazing Tolmin Gorge for the day, stopping off at the beautiful village of Kanal along the way to admire the Soca river. Tuesday, you can go walking up nearby Nanos mountain and take lunch at the top. Wednesday, visit the Lipizzaner horses at Lipica and go to the stunning unesco protected Skocjan caves. 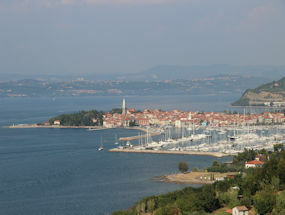 Thursday, relax by the warm mediterranean coast and have a swim at Piran. Friday would be a great day to take a trip to the amazing Lake Bled and the Slovene Julian Alps. Saturday, you could walk directly from Lipizzaner Lodge to fairytale Predjama castle in the morning, visit a honey farm after lunch and do some wine tasting in the evening. Then Sunday, you could take a bike ride along one of many country tracks surrounding Landol and have a massage on your return. 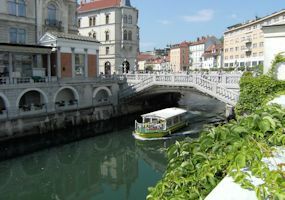 On Monday, take the train to Ljubljana, visit the castle, riverside cafes and shops, returning for a nice evening sauna. Tuesday would be a great day to take a bike ride alongside the crystal clear Sava river on the bike track from the steel town of Jesenice all the way to Slovenia's border with Italy. Wednesday, visit the amazing Mercury mine in Idria and take a walk along the forest track to Slovenia's shortest river and have a swim. Thursday, go shopping in Koper on the Slovene coast and have a nice lunch and afternoon stroll in the nearby seaside town of Izola. Friday would be great to visit Slovenia's most beautiful lake Bohinj, with a walk to a mountain waterfall and some swimming in the lake. Saturday, take a trip south, one hour, to the Croatian coast and the delightful coastal town of Opatija. Sunday, take a bike or walk along forest & countryside tracks to nearby Postojna to visit the world famous Postojna caves. Monday, How about a drive to the lower Soca valley visiting lovely places along the river and stopping close to Kobarid to find the amazing "Kojak" waterfall, (Kozjak). There are a few ways you can walk there and you can even swim at the waterfall, but most people just admire the beauty and power of nature. Tuesday, go for a bike ride in the morning up into the Nanos forest, along mountain tracks and back to Landol, then have a massage and sauna in the afternoon, before settling down with a good book or movie. Wednesday, have a day out in Trieste, parking on top of the cliff at the pretty town of Opcina and using the antique tram to go down to the seafront and city for the day, having a wonderful local pizza back in Opcina in the evening. 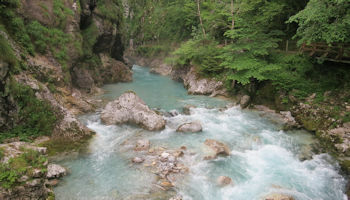 Thursday, take the "grand Tour" which is a wonderful loop either clockwise or anticlockwise from the Lodge taking in the amazing Vrsic Alpine pass and no end of possible treats along the way, depending on what you would like to see, but think rivers, gorges, lakes, mountains and forests.. all that is best about Slovenia! Friday, take a bike and cycle along the Slovenian coast from Koper to Piran, along a disused railway, converted into a fabulous cycle path, plenty of time to swim and get an ice cream! Saturday, take a trip south to Bistrica to spend the day with our friend, Slovenia's best known TV chef, Richard Basa and learn how to cook a delicious Slovenian dish. Sunday, have a day in Slovenia's ancient forest and visit Europe's largest disappearing lake, (in the Winter it is full of water, in the Summer, the water has mysteriously vanished! 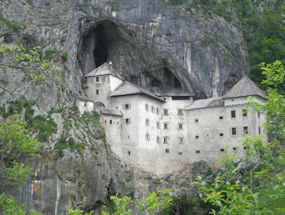 ), also visit the stunning forest castle of Sneznik, (Snow Mountain). On Monday you can take the car or jump on the train for a day out in Venice.. you could even fly there for the day with our partner airline Janez Air for an unforgettable trip. Tuesday, you could take some sandwiches and go for a walk up the local St Lawrence mountain, (we call it Stairway to Heaven) and admire the view, perhaps visiting another one of Slovenia's nearby disappearing lakes before returning home. Wednesday, take a trip up to the north of Slovenia to the Alps via the beautiful "Little Lake" Jezersko.. there are some castles hidden away in the countryside to visit on the way. Thursday, revisit Piran on the coast, but this time don't park in the town, leave the car several km's away and walk along the coastal path to see this pretty town from another stunning angle. Friday would be a great day to go to the Gorica hills wine region, visiting castles and pretty villages along the way, making "Cramp Gorge" the final point in your round trip and tasting some local wine on the way home. Saturday, you could follow the amazing St James' pilgrim walk all the way from the Lodge to Predjama castle, then snaking along the slopes and forest of the Nanos mountain just like Pilgrims have trodden for centuries.. all the time looking for the easy to follow yellow arrows. Then Sunday, spend the day on top of one of our favourite mountains in Slovenia, "Heaven on Earth" (Velika Planina), go up by cable car or plot your route through the forest. On the flat top there are the most amazing views and a little Hobbit-like village where the locals make cheese in the summer and cows wander around jingling their bells! On Monday, take a trip to see the most wonderful Secret WW2 Hospital, hidden at the top of a river path in the forest and mountains. 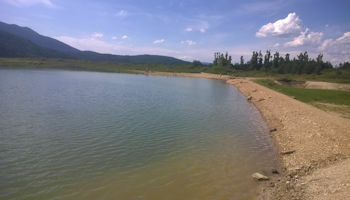 there are plenty of places to have a swim or dip along the way and be sure to try the local pasta dish when there. Tuesday spend the day in the coastal hinterland, surrounded by vineyards and olive groves, visiting an amazing church "fortress" with a rare 500 year old medieval fresco. 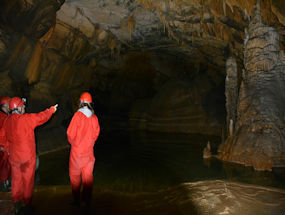 Visit Slovenia's best american burger diner on the way back and in afternoon, take a private cave tour down possible the best overall cave in the world.. "Devils Barbeque" Dimnice cave with a little bit of all that is good about caves in every corner to explore. Wednesday, spend the day next to the Planina disappearing lake, walk along one of Europes most expensive rainbow trout rivers and find Rapunzel's tower and a secret cave into the bargain.. if you are lucky the cave will have a cloud floating through it! Thursday, go on a short trip down to Istria (between Slovenia and Croatia) and explore 2 beautiful hill villages with stunning views, cafes, artist shops and places to eat. Friday revisit Slovenia's most beautiful lake Bohinj, but this time spend the day walking up the nearby amazing "Little Bridge Gorge" (Mostnica), you could spend all day here and swim, but be sure to take the whole 5 hour roundtrip walk into the alps to the Mostnica waterfall and back! Saturday. Go chill for the day in the Vipava valley, maybe go from the Lodge up the wonderful forest road and then at 1,000m up along the rim of the valley, hiking to the Okno (window) to see the view from atop and then spending your afternoon and evening relaxing in the valley at one of several wonderful restaurants. Sunday, take a bike and head out through forest, fields and tiny little local roads to the "Black Cave", which actually joins the Postojna cave. Take a tour and then do the amazingly long downhill and some more cross country back towards the lodge for an ace day out on the bike. Monday, take a daytrip north to visit the amazing castle at Ptuj, then call in at our partner vineyard above Maribor for a relaxing afternoon wine tasting and enjoying the countryside, or continue the tour directly through Slovenia's stunning Jerusalem mini region. 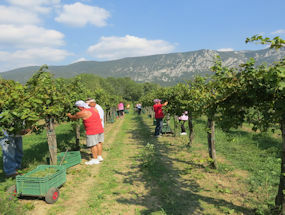 Tuesday, go for an early morning forest walk and then after breakfast, take a trip to the Karst region to check out the local unique Teran wine and liquers. As you will be so close to the Italalian coast here, then why not spend the afternoon at the beach of Sistiana or take a cliff top walk to an amazing castello. Wednesday, take a trip along another of Slovenia's most beautiful rivers, the Krka, which has a bottle green colour. Take in Cucumber castle and visit a huge monastery converted into Slovenia's largest art gallery, with dozens of hand carved wooden sculptures in the surrounding fields. Thursday, it's time to do some white water rafting, so either go north to the Soca river and visit the incredibly interesting and moving Kobarid military war museum afterwards, or go south to the Kolpa river for rafting and a trip through Croatia on the way home. Friday, go with a local guide to explore some of the leafy lanes and rocky roads in our local area. See where a huge Celtic fortress dominated our valley and hear how it took the Romans hundreds of years to push them out. Saturday, join a 4 wheel drive adventure with a local guiding team where you follow a local tank assualt course, explore part of a labyrinth of local WW1 & 2 tunnels and make a campfire. Then visit the local tank museum where there is a wonderful exhibition about Slovenia's very short war of Indepence. Sunday, take a walk up the Slovenia's highest non Alpine mountain, Sneznik, 1,796m (Snow Mountain), which has an abundance of forest and floral life and is a very generous mountain to walk up with a gradual incline. The view from the top is stunning. So, there you have it, 6 weeks full of action for you and there are so many other things to do that we just didn't even have space to mention! You can also easily fit 2 or 3 completely different activities into your day as the distances here are so small and the variety so great. If you are a keen cyclist or hiker, you can ride or walk somewhere new, in different terrain each day. If you love horses you can ride somewhere new every day. If you love wine, we have a different wine tour each day for you! Most people will enjoy a mix of what Slovenia has to offer. We look forward to seeing you soon!